This past weekend, January 9-11, 2009, we held our first-ever Fire & Ink Board & Planning Retreat at Alma de Mujer Center for Social Change. Some wonderful pictures are posted below, and on Facebook Group. We got together to review some of the most amazing abstract proposals we’ve ever received or seen. 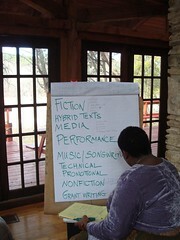 The full proposal deadline is March 30, 2009, but already the exciting ideas are pouring forth, including the engagement of visual artists and literary artists dialoguing about how we support each other in the work. Stay tuned for more information, coming in March, about registration, our host hotel, and the beautiful conference site. Many thanks to everyone in the Austin community who came together to support our efforts, especially to Stephanie Lang and Johnathan Fleming at the University of Texas’ John L. Warfield Center for African & African American Studies. While together, we handled a lot of business but we also got to party a little bit after taking a break to check out delta dandi, former Fire & Ink board member Sharon Bridgforth’s newest groundbreaking play. Sign up on our e-mail list, subscribe to our YouTube Channel, join our Facebook Group and stay informed, share the word, and get involved with Fire & Ink. If you’ve missed it before, now is your chance to join us in making history happen — one letter at a time!